Miele's premium appliances benefit from cutting-edge design and renowned German build quality. 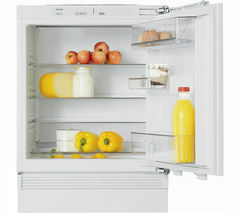 Miele fridges boast the latest in refrigeration innovation to keep your food fresher for longer in clever new ways. Available in a range of capacities and finishes, the Miele fridge range is designed to look good as well as to deliver superior cooling performance. 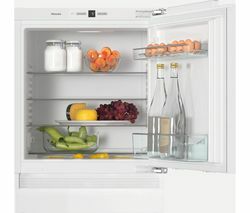 PerfectFresh technology ensures that Miele fridges provide longer storage life. Food remains fresh for up to three times longer, for better flavour and quality. In the humidity-controlled PerfectFresh compartment, fruits and vegetables have an optimum climate, and nutrients, taste and consistency are maintained for a long time. Miele's DynaCool system ensures that air humidity is controlled as precisely as temperature. With Dynamic cooling, an integrated fan uniformly circulates the air, optimally distributing the temperature and air humidity for better performance. No more odours. Miele's Active AirClean Filter uses a special combination of active charcoal and chitosan, a natural product, to eliminate virtually all odours from the refrigerator. The filter is quick and easy to fit and is ready to be used straight away. MasterCool drawers are humidity-controlled and make sure that food is stored in individual micro-climates. The temperature stays at approximately 0 ºC and the humidity is perfectly adapted to suit all food types, especially fruit and vegetables. Miele's fridges also feature clever, adjustable lighting. Its new FlexiLight LED glass shelf lighting illuminates with no glare and can be positioned on any shelf level you like. For a bigger selection of stylish home refrigeration options, take a look at our American style fridge freezers and retro-style Smeg fridge freezer range.